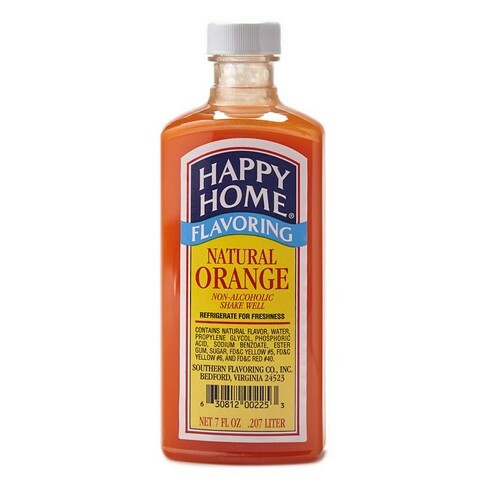 Happy Home Natural Orange Flavor, Natural Baking Flavors: Southern Flavoring Company, Inc. Happy Home Natural Orange Flavor is delicious when paired with chocolate. Add it into your favorite fudge or truffle recipe. Or, go a little bit lighter and whisk it into a gooey poke cake. I ordered this shipment for my sweet Ex mother in law and now will order mine. We have used your products since I was around 22 and I am now 48 and we absolutely LOVE them.... Sure would love to get a coupon code for a discount if at all possible because I'm placing a pretty big order soon. Thanks so much for the quick delivery as well. You're awesome!! I have ordered from Southern Flavoring for several years and I am over the top with joy about their products! I do a lot of baking (ranging from 15-30 cakes) for different holidays for family and friends and Southern Flavorings has not let me down yet! Great flavorings at a GREAT PRICE (and if you purchase 24 in any combination you get a HUGE discount). Great results in ALL of my baking - cookies, cakes, buttercreams, EVERY application.Have been using them for YEARS! I love your flavorings and have used them for years... My supplier recently went out of business so I am excited to be able to order them online. Owner Response: Thanks for your comments Angel. We look forward to serving you! Your service is always on point. We never have any problems with our orders and our customers are truly satisfied with their purchases. Great customer service!!! Owner Response: Thank you for your nice comments Janice! Owner Response: Thank you Linda! Our Natural Orange Flavoring is made with pure orange oil and is preferred by home bakers and commercial bakers alike! We are so glad that you are using it. Best orange cake yet, according to my mother! Customers at our restaurant have come in asking if there is any left (from 2 days ago). Love this product, use it for a cookie and a glaze for a cookie and it has awesome flavor and color! Highly recommend this product! I am very pleased with my recent order from Southern Flavoring. I ordered 7 bottles of a variety of flavorings. The ordering process very easy and my shipment arrived to my home within a few days. I had been searching for Happy Home flavorings in my area and was not able to find a dealer nearby, so I did a Google search and found the flavorings on Southern Flavoring. I am very happy with my purchase. I love to use flavorings in many things: cooking, teas, smoothies. Thank you for having this great product and the ease in ordering and fast shipment.